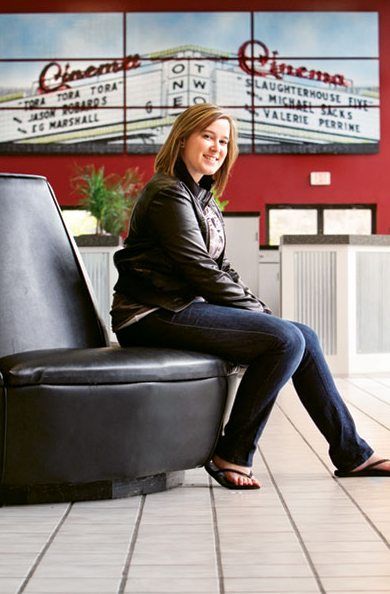 With Savvy Marketing and Dedication to Community, a Dynamic Business Team Breathes New Life into Leitersburg Cinemas. Driving past the movie theater on Leitersburg Pike, the clean new façade and bold garnet palette is eye catching among the fields. Stepping through the glass doors, the fresh color is carried over on dramatic accent walls, which set off modern, multipaneled wall art showcasing the original movie marquee. The updated snack bar is faced in corrugated metal panels, a design element that has tastefully replaced the old red carpeting that previously covered the lower portion of the lobby walls. Updated seating — including sleek leather recliners for the VIP theater’s “Dinner & A Movie” nights — offers moviegoers a comfy viewing experience. More than five years ago, Rich and Dave joined forces to create High Rock Studios, a venture that has flourished to become an area leader in marketing, design and web development. In reviving Leitersburg Cinemas, the pair have embarked on their most challenging journey yet. The building and land, owned by Ridenour 1994 Family LLP, were put up for auction in March of 2009, but no one made the minimum bid. The last operator, Diamond Cinemas, shut the theater’s doors in October of 2009. Two and a half years ago, LifeHouse Church East began leasing Leitersburg Cinemas for two Sunday morning services and at one point considered purchasing the building. “They didn’t bid during the auction, but we started having a ‘what if’ conversation about the church cooperating with a business that was here that wanted to turn around Leitersburg Cinemas aesthetically, inside and out,” Rich says. “There were two organizations that if they came together, could enhance the facility again to make it a nice movie theater and a nice place to be on Sunday morning for church.” Rich and Dave made the decision to become that other organization in the equation, and formed Leitersburg Cinemas, LLC. Advanced ticket purchase is required before 10 a.m. on the day of the movie. Includes movie ticket, Fun Pack (popcorn, drink and snack) and use of birthday area after movie for one hour. Seating for up to 425 and smaller meeting spaces for up to 30 with leather recliners. Great for seminars, training, concerts and team building. Leitersburg Cinemas Harnesses the Power of Facebook to Reach Movie Fans. Social media savvy professionals Rich Daughtridge and Dave Schleigh knew that Facebook was going to be a major platform for them when they formed Leitersburg Cinemas, LLC. Armed with the knowledge that their demographic was 14- to 19-year-olds, they were well aware that Facebook is the way to reach teens without spending a ton of money on advertising. They launched the Leitersburg Cinemas’ Facebook page well before the theater re-opened, and it has more than 2,600 fans as of press time. Rich adds that Facebook is a great way to let fans know about movies and upcoming movie trailers. There have even been polls concerning what kind of candy the theater should sell in the snack bar. Sometimes there’s even a secret word posted on the Facebook page that moviegoers can use to get a free popcorn (hint, hint).